The device comes with a worldwide basemap with shaded relief, so you can navigate anywhere with ease. Adding more maps is easy with Garmin's wide array of detailed topographic, marine and road maps. 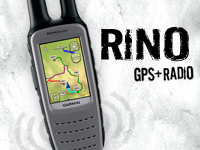 With its microSD™ card slot, Rino 650 lets you load TOPO U.S. 24K maps and hit the trail or plug in BlueChart® g2 preloaded cards for a great day on the water. The device also supports BirdsEye Satellite Imagery (subscription required), that lets you download satellite images to your device and integrate them with your maps. In addition, Rino 650 is compatible with Custom Maps, free software that transforms paper and electronic maps into downloadable maps for your device.